By Dana E. Prescott, Esq. and Neil D. Jamieson, Jr.
Dana E. Prescott, Esq. and Neil D. Jamieson, Jr.
Are You Getting a Divorce in Maine? If so, you need all the accurate, objective information you can get to help you make the right decisions for your future. But gathering essential facts about property settlement, division of debt, child custody and support, and so many other pressing subjects can be a time-consuming and frustrating experience. Fortunately, attorneys Dana E. Prescott, and Neil D. Jamieson, Jr. understand your need to know. During their combined years of practicing law, they have helped hundreds of individuals navigate the maze of divorce. 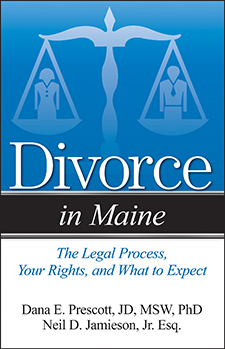 In Divorce in Maine they answers not only the questions on your mind but also those you may not have thought to ask. What is the mediation process and does Maine require that my spouse and I go through it? How quickly can I get a divorce in Maine? How can I get a divorce if my spouse doesn’t want one? Who decides who gets the cars, the pets, and the house? What actions of mine might influence my getting getting custody of the children? How are bills divided and paid during the divorce? Who will be responsible for my attorney fees? Answers to 360 legal questions!